Simply Laser is excited to be offering EndyMed treatments for acne scars- the latest technology in fractional skin resurfacing. If you’ve got stubborn acne scars or pigmentation, EndyMed offers an accessible, fast solution with minimal discomfort and no downtime. EndyMed treatments offer a powerful and lasting solution to a wide range of skin concerns, one of them being acne scarring. EndyMed’s unique 3DEEP system allows radiofrequency technology to penetrate three layers deep into the skin. As this energy reaches the deeper layers of skin, it reactivates collagen production for smoother, fresher skin. Perhaps the most common question we’re asked about EndyMed treatments, is whether or not they’re painful. Luckily, EndyMed technology has been designed to reach deep into the skin without overheating or causing pain to the epidermis. Most of our clients report no more than mild levels of discomfort from these treatments, but we can offer anesthetic cream to numb the treatment area if you’d prefer. While your skin will continue to improve in proportion to how many EndyMed treatments you decide to have, we’d recommend having at least two treatments a few weeks apart to see results. However, if your scarring is deep, more treatments may be required. Our beauty therapists will conduct a skin analysis to recommend the best course of action. Once the treatments have been completed, you’ll see many improvements to the quality of your skin. Not only will your acne scars have significantly diminished, you’ll also notice tighter, more contoured skin with an even-toned, glowing complexion. Recently, Elizabeth Best from She Said came to us to treat mild scarring and pigmentation on her face. After a handful of Dermapen and EndyMed treatments, the results speak for themselves. See her before and after EndyMed photos, and more on our EndyMed treatment page. If you’d like to get started with EndyMed for acne scars treatments, please get in touch with our team. We offer free initial consultations to discuss all of your options, so give us a call on (07) 3211 4785 or book your appointment online. 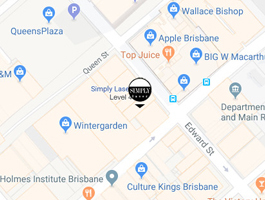 Our clinic is located in a discreet, convenient location in the Brisbane CBD.